The classic Vampire from days gone by would be smartly dresses like a true gentleman. One of the items of clothing would be a frilled neckpiece or Jabot. 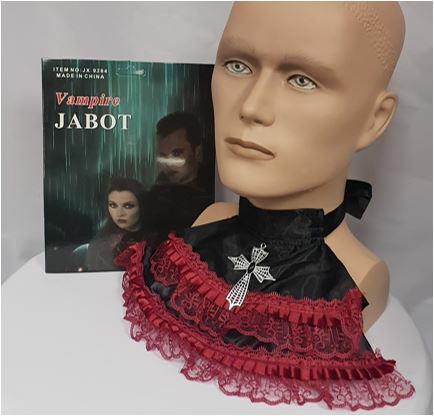 This is a black jabot with burgundy lace and fastens at the neck with Velcro. There is a gothic style cross with black stone hanging in the front. Add a stylish jacket and some vampire teeth and go forth into the night looking for your next……..